It's Monday, which means another weekend behind us. I had a particularly lazy two days that involved several hours of Outlander, several hours of Parks & Rec, and several hours of reading. What's not to love about that? I started--and finished--Newport, by Jill Morrow, a 1920s-era novel about a family contesting their patriarch's will that includes seances and mysticism and all kinds of dirty secrets. While not the type of book I'm usually drawn to, I was caught up in the first few chapters and wasn't disappointed in the end. I also finished At Hawthorn Time, a quiet and slow-building novel about strangers living in the English countryside. Reviews of both will come in Shelf Awareness for Readers next month. I'm slowly working through Charity Detox, the sequel to the controversial 2011 book by the same author, Toxic Charity. While I agree with many of the author's points about the state of non-profit work in the United States today, I take strong issue with a) the way many arguments are presented and b) the religious overtones in the book as a whole. Still wrapping my mind around how to write about a book that I think is worth reading as part of a conversation, though I'd never recommend it as standalone on a subject. 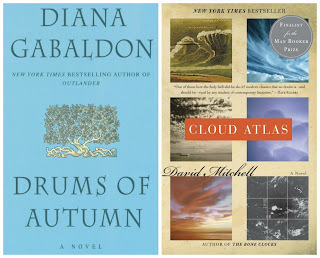 I expect this will be a quiet week in reading for me as I've got a boatload of household projects on my list, though I'm still working my way through Cloud Atlas and Drums of Autumn. 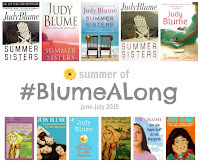 And in case you didn't see it last week: I'm hosting a Summer of #BlumeALong event, starting next week! Won't you join us? We're reading Are You There God? It's Me Margaret first, then Summer Sisters in July. Come for one, come for both! Newport sounds like a fun beach read! I love family dysfunction, secrets, etc. Yes! Once I picked it back up yesterday for more than 10 minutes, I really found my groove. I expect I'll finish it this week. How far are you? It took me through the second Orison of Somni to get hooked into it again (I had stopped after Shoosha before). Oh yeah, I think that's the Sloosha section. That was the toughest for me; I had a hard time with the language and piecing together the story. Now that I'm on the other side, though, I'm loving it again. I can't imagine HOW he imagined these stories. The #Blumealong makes me want to read one of her books again. I went through a huge Blume stage a long, long time ago, but one is never too old to enjoy good stories. I hope you'll join us! It will be interesting to see how (or if!) reactions of new-to-Blume readers differ from those revisiting her books, I think. Good to know there's light at the end of the tunnel! What kind of religious overtones are they? I don't think I knew this about Toxic Charity -- it's been sort of vaguely on my radar for a while as something I might want to read, but I don't truly know much about it. The author is apparently pretty involved in mission work and church-based charities, which, given the linking between charity and religion in the United States historically and his own background, means a lot of his examples are faith-based organizations. That I have no problem with, though his examples of long-term missionary work bringing spiritual relief to international countries is a bit outside my interest area. The bigger issue that I take is that even things that have no need to be based in religion or God are in his language: i.e. "the blessings of hard work" and the "God-given desire to relieve suffering and come to the aid of victims of hardships." Those references don't really add anything, to me, and are so plentiful that they're distracting from his overall point. But then, I'm a particularly non-religious person, so I might take more issue with that type of language than others. I just don't think it adds anything to his argument and only serves to alienate a large portion of his potential readership. Absolutely with you on trying to clear out the "currently reading" list! I think you explained yourself wonderfully when you said the book is only part of a larger conversation—maybe recommend some others in your review that you think do a good job of rounding out the discussion. Hope you make more progress on Cloud Atlas ! I definitely found it a tough book to read because of the different time periods and characters. Sloosha was definitely the most challenging section for me too because of the language.